For me this is the chocolate mousse by which all others are judged. I have paid $10 for desert at fancy French restaurant and gotten something that was not even close to the oral satisfaction of my mother’s mousse. Before I left home for the first time, I sat down with my mother’s recipe box and wrote down my favorite dishes. I have made a few changes from my mother’s original recipe. The most significant being that I have doubled her recipe and NO! There is no such thing as too much of a good thing! The only other change I have made is that mom always made this desert with Nestle’s Semi-sweet Chocolate Bits. Chocolate snobs that we are, we always make it with high end dark chocolate. Note: How much you fold the mix is a delicate operation. If you stir or fold the mix too much you will knock the air out of the egg whites and the whipped cream. You will be left with a dense unappealing mass. 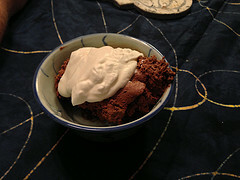 If you do not fold the mix enough the denser chocolate mixturs will partially separate from the whip cream. Instead of a uniform creamy mousse, you will end up with a slightly dense pudding layer and a fluffy creamy layer. This separation is not necessarily a bad thing, especially if you are serving the mousse in individual bowls, you get two chocolaty experiences for the price of one, but it is not the true mousse. 1. Mix the gelatin, ½ cup sugar and the salt thoroughly in the top of a double boiler (if you do not have a D.B. a metal mixing bowl over a pot of water works fine). 2. Beat together the egg yolks and milk and add them to the top on the gelatin mixture. 3. Add the chocolate bits and cook over boiling water, stirring constantly until the chocolate is completely melted and well blended. 4. Remove the chocolate from the heat, stir in the vanilla and chill until the sauce is thickened. 6. Beat ½ cup sugar into the egg whites and then fold them into the chocolate mix. Folding is not the same as stirring. To fold you take a spatula and gently scoop the mix from the bottom, bring it up and lay it in the top. Rotate the bowl a quarter turn and repeat until the mix is well blended. 7. Whip the cream and fold it into the mix. 8. At this point you may spoon the mousse into individual serving cups or into a display serving bowl (we use a clear glass, floral, salad bowl). Do not disturb the mousse once it has started to set.